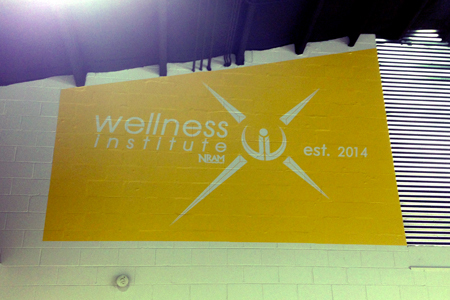 This is a stencil that we created and installed for the NRAM Wellness Center to paint over and remove; revealing their artwork on the wall. Have you ever had a question of which you were unable to find the answer, or apprehensive of asking? If so, you've come to the right place! As the name would suggest, this section is a compilation of Questions & Answers our clients commonly ask. Simply follow the links below to get started on finding your answers. Should you think of question that is not on this list, please click "Ask a Question" and let us know what you're thinking. If enough people ask the same question, we'll post the answer in this section for future visitors. Unfortunately, there just isn't a short answer to this question. Some jobs can be produced in minutes and some may take longer depending on how much work is involved, and where it is going. If our clients can give us a timeline as to when they would need the sign to be completed, then we'll let you know if it can be done. We go to great lengths to meet the needs of our customers. Every job is important and every job is produced as efficiently as possible. A proof is basically a preview of what your artwork will look like when it goes into production. It is way of ensuring that we have set your type accurately and that everything is positioned according to your requirements. This is also the time to check spelling, colors, and sizes of the artwork as well - if there are any errors, or changes to be made, the Proof Stage is the time to recognize them. Typically, we will produce the proof which will be sent to you via email or printed on paper, and can be viewed in our store. The Proof Stage is a part of our creative process. Whether our clients have given us everything we need, or not, it is still an important step to take a look at what your artwork is going to look like by the time we have finished with it. Your approval on the final proof is assurance that you have looked over every aspect of our work and have determined that it meets your needs and that the information is correct. It is a lot easier to fix mistakes in the Proof Stage rather than after the job has been completed; this way everyone is happy! Short answer, YES. It may seem like a proof wouldn't be needed in this case but it really is. Output devices process digital information using a variety of processing languages. Your approval of the proof which we will provide assures that the output device used has correctly interpreted and processed the information you have provided. A proof is a way to make sure everything is as it needs to be. This is a great opportunity for you to take a look at our Estimate Request form in the Products and Services tab. It is easy to fill out and one of our representatives will receive it upon completion. Otherwise, the best way to ensure that we get all the information necessary to do an accurate quote, is to give us a call and talk with one of our customer service representatives.